Apollo hold the silvery bow and bring the golden arrows in his pocket. He is going to kill the python-----was send by Hera to kill Leto----Apollo's mother. And now he is coming to revenge for his mother. He arrived the place where the python lived, python lived in the dark, deep and smelly hole. 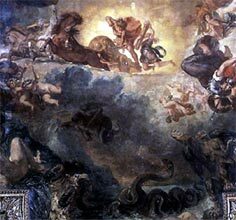 Then they started fight, the python try to eat Apollo, but Apollo shoot to python use his silvery bow and golden arrows, he has the best shooting skill on the world. Then his golden arrow through python's head, python was killed by Apollo's golden arrow. Then Apollo building the oracle of Delphi(Pythia). And use heptachord to make a song-------This was the moment where Apollo became the god of Music.